There are different schools of thought in the parkour community when it comes to training in a gym and training outside. There is a group that thinks training in a gym makes you weak and there is a group that believes that training in gyms is all you need to be a successful athlete. Both of these views are wrong though. You need to train in gyms AND you need to train outside. They are not the same thing. They are two very different types of training, two very different types of mental game, and you need both of them to be a successful well rounded athlete. Training in a gym has numerous benefits such as moveable obstacles, ideal training conditions and is filled with people, coaches, and colleagues that want to help you succeed and improve. Having a place to train where you are constantly supported is a major step in getting comfortable with your movements and making new friends. When training inside a gym you will have all the social support you need. However, the spectators outside can be unforgiving and downright obnoxious while you train. They can yell at you to stop what you're doing, or yell to do a backflip, cat call, etc; which is very different from the encouraging and supportive gym environment that is inside. Dealing with this properly will strengthen your mental game, by teaching you how to block out outside distractions and to hyper focus on your movements. Another important difference between training inside and outside is learning how to adapt to uncontrollable environmental factors. Training in the rain for example may seem daunting and uncomfortable but if approached with extra caution can strengthen an athletes trust in his or her own abilities. In dryer conditions you might be able to get away with sloppy form for a rail precision, but if it’s raining you will need to focus more on your foot placement and technique. The convenient part about having a space inside is that you can opt out of training outside when weather conditions get to unsafe such as extreme heat or cold. Non-moving obstacles are as helpful as stationary obstacles. They help fuel your creativity and your ability to adapt to new heights, strange shapes, and weird spots. They also help you overcome fear by forcing you to mindfully work a move slowly instead of just throwing yourself at it with the attitude that a pad will cover up your mistake.Pads and movable obstacles help you in more ways than one. They give you a chance to overcome fears and master skills in incremental ways. With the moveable obstacles your able to recreate the same same challenge over and over, making it bigger and smaller as needed until you’ve successfully and consistently overcome the fear or the move. The pads also benefit this by taking away impact and giving you more confidence to commit to a move. Training outside is essential for a parkour athlete. It helps you learn to be adaptable and helps you strengthen your mental game. However, training in a gym is also good for you as an athlete. It give you a space to practice consistency, as well as provide an encouraging learning environment. They are two very different styles of training, but at the end of the day you need both outside training and inside training to be a well rounded athlete. Habits and Styles of Training: Sustainability, not Everyone is Domtomato. Sustainability, not Everyone is Domtomato. In the age of the internet it’s easier than ever to fall into the trap of imitation. We’re bombarded by a constant stream of media telling us how we should look, act, and now move, and this is dangerous. Each person has different attributes and abilities that are specific to them. 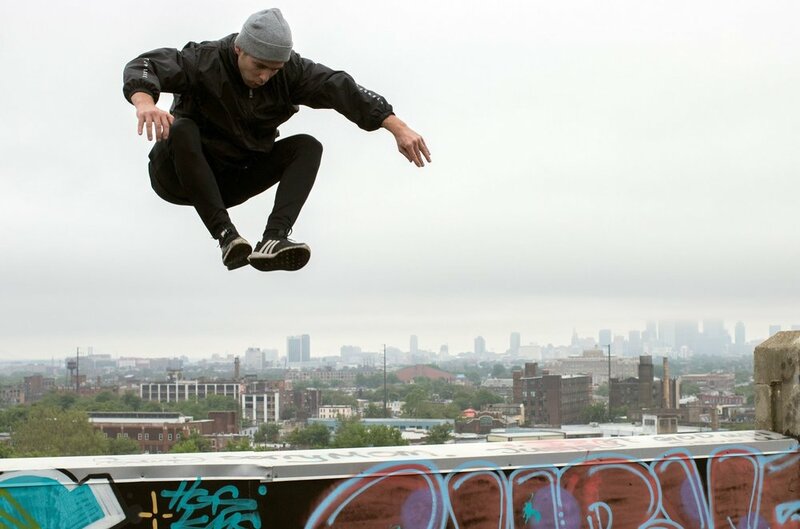 Because of Dominic Tomasso's years of ice skating, his strong parkour technique, and his Australian heritage, he has the ability to take massive height drops. You’re a different person with different abilities, and totally separate strengths and weak points. You are not Dominic Tomasso. You probably cannot train like him (If you want knees). Because parkour has only been around for a blink of an eye in comparison to many of our sports, very little data has been gathered about different training styles, and how they affect longevity. Stretching and mobility, are essential. These two facets of training are often very easily overlooked, especially by younger athletes. Parkour is a lot of muscle compression, and fast extension. We rely on explosive amounts of power to hit big jumps, or massive tricks. This builds an imbalance in our muscles, and leads to shortened and tight muscles. Tight muscles leads to injuries, and not just short term injuries, but chronic injuries, that can plague you throughout your entire jumping career. Almost every kind of imbalance is a negative thing. To help build longevity into your training, you should balance out of the explosive tendencies of parkour with some muscle extension type movements. One excellent example of this is yoga. Yoga focuses on extending, and elongating muscles through slow, and steady movements. This works in counterpart with parkour to help keep our muscles long and limber. With the advent of the internet, it’s easy to see the end results of years of training, without seeing the hard work that goes into it. 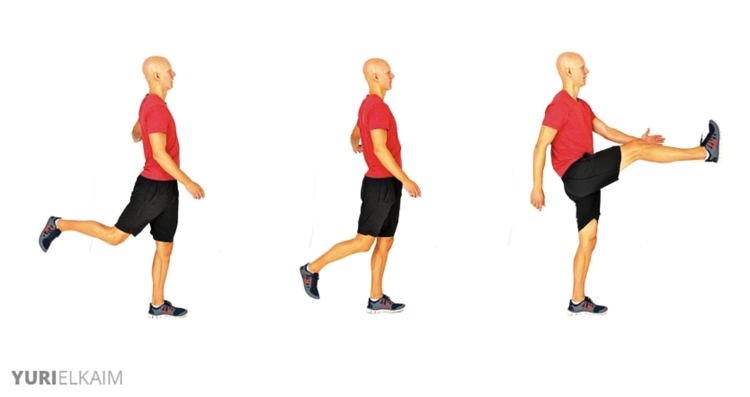 This can lead to an ill-perceived idea of what the prerequisites for certain movements are, and can easily lead to athletes overextending themselves, and doing movements or skills which they are not ready for. The best way to know if you’re ready to attempt a jump, or a trick is to gauge the failing options. What’s the worst case scenario? Does it involve serious injury, or even death? Probably don’t attempt the move. Only go for things which you are 100% sure that you can fail without risk of injury. Every injury you attain will stick around for much longer than you think, pulled muscles turn into chronic injuries when they happen repeatedly, and that will undoubtedly shorten your career. An easy trap for new athletes to fall into is focusing on big and flashy moves, instead of honing in on their Ukemi, Bounce-backs, and Footwork. Having solid basics is essential before attempting any high impact or high difficulty movements. Think of parkour as a house, if you build your house on a weak foundation, but try to build it up as tall as you like, your house is going to collapse. So will your body without a solid foundation of basics. All of the athletes that you see taking massive height drops, doing immense rail-pres, or stomping triple twists outside, have been training for years, and have an excellent foundation of basics. When you see people wrecking themselves in spectacular ways, it’s a reasonable assumption that they haven’t put the time in to work on their technique. To have a sustainable training style requires knowledge of one's own body. Even though social media can make athletes seem almost superhuman at times, you must realize that it took a long time for them to develop such awareness of their bodies. You may even strive to want to do some of the incredible feats that these athletes have accomplished but you must also understand that it will take time, and that you must enjoy the process of being a beginner to lay the proper foundation for your movement practice. We are not saying that you should not push yourself, or eventually attempt difficult moves, just that you should respect the prerequisites. 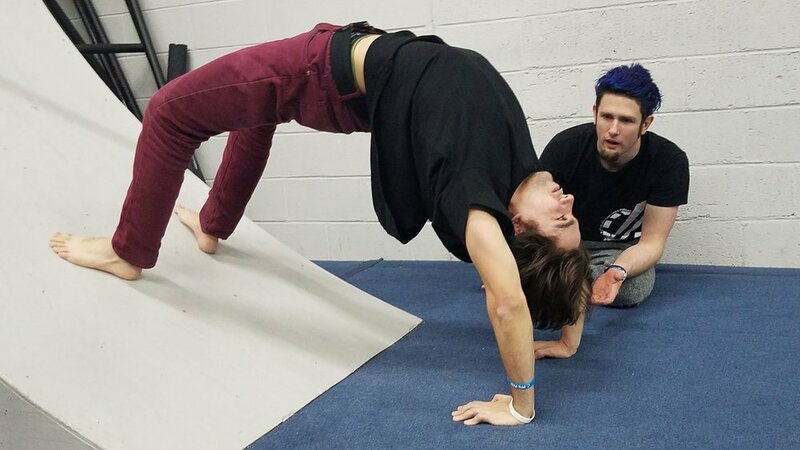 Don’t mindlessly rush into advanced tricks, find a trusted gym, or community leader, and reach out to them for where the best place to learn in your community is. 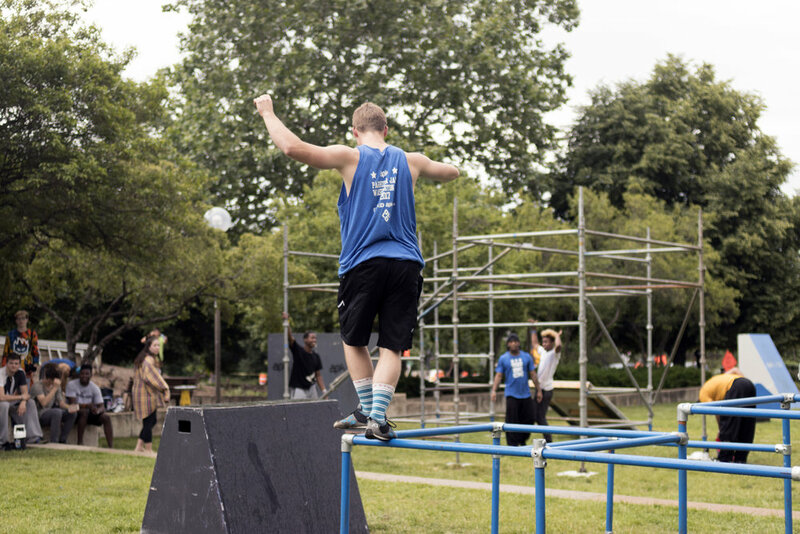 In some scenarios you may not have access to a community or gym, in these cases we recommend checking out our friends over at https://parkouredu.org/, or if you’re looking for free tutorials you can check out Zoic Nations tutorials by our head coach Andy Taylor! Well, that’s cause this article is a 2.0, a follow up to a previous article we did on our favorite shoes for parkour. A good parkour shoe has durable grip that works on a multitude of surfaces. Shoes with foam bottoms are an immediate no, as they will easily slide off of objects. A good parkour shoe is flexible enough to not restrain you. You should be able to easily fold the shoe in half with your hands. A good parkour shoe has enough padding to absorb some impact, while not being so thick that you can’t feel the ground under you. A good parkour shoe is light, a heavy shoe will make it very hard to quickly re-position your feet. A good parkour shoe is breathable. Shoes with little breath-ability will make your feet feel like mini-swamps shortly into your session. A good parkour shoe is durable. If your shoe breaks easily, it’s gonna break your bank. Flexibility is a key aspect of being a healthy, and well rounded athletic individual. Without flexibility, not only will your body feel very stiff, you’ll be unable to attempt key aspects of your sport, and you will be highly susceptible to more serious injuries. According to the American Council on Exercise (ACE), flexibility is defined as "the range of motion of a given joint or group of joints or the level of tissue extensibility that a muscle group possesses." What this means is, flexibility is determined by how large a muscle’s (or group of muscles) range of motion is.There are a plethora of different ways to stretch, and the three main ways to stretch that we will be focusing on in this article are static, dynamic, and active. All of these types of stretching will help you gain flexibility, but they all work differently, and, beyond just being able to bend further, have slightly different effects overall. Static stretching is a type of stretching, where you hold poses for 10-30 seconds, and is generally a very deep stretch. Up until recently sport professionals thought that static stretching was the best form of stretching. Static stretching is the most common type of stretching, and is generally what people think of when they think of stretching. Static stretching is generally accepted as good for improving overall flexibility, but has been shown to be less effective when done before strength training, or hard exercise rather than after. It is essential to warm up prior to static stretching in order to prevent injury. Dynamic Stretching involves movement and muscular effort for a stretch to occur. While static stretching takes a muscle to its full length and holds it there for 15 to 60 seconds, a dynamic stretch takes soft tissues to their full length and rather than holding it, after a brief pause of 3 to five seconds, the muscle being stretched contracts and the muscles and tendons exert a force in that lengthened position. By doing this we lengthen the muscle, strengthen it in its new range, and also work on balance and coordination. This type of stretching has been known to increase power and endurance, as well as improve coordination and balance. Active stretching involves holding the stretched position with the opposing muscle group. This means actively contracting one muscle group so the other can get a deeper stretch. Active stretching stimulates and prepares muscles for use during exercise. Active stretches not only stretch the muscles and tissues, but prepare the muscles for strenuous usage by activating and warming them up. This in conjunction with dynamic and static stretching will not only improve your parkour training but also your day to day functions in life. Stretching is an essential habit that should be built into any athletes training regime. The sooner one adopts a consistent stretching habit the quicker the athlete will feel more capable in their movement and be less at risk for injuries. However, adopting healthy habits as an athlete is easier said than done, but that is a topic for another article all together. Not every type of stretching is ideal for every person, so figuring out what works best for you and what will help you reach your goals is important. Overall, stretching is important because it keeps the muscles flexible, strong, and healthy, and we need that flexibility to maintain a range of motion in the joints. Without it, the muscles shorten and become tight, which makes certain movements hard and sometimes even impossible to achieve. Fear is one of those things that you either run from or you run towards. It is either a motivator or a deterrent. Most people nowadays choose to run away from fear and “play it safe” or to be very “comfortable” in their everyday lives. What I mean by “comfortable” are the people who choose to be very risk-averse and run away at the first sign of a situation that makes them feel uneasy or awkward. However, what they should be doing is running towards that fear, running towards that uncomfortable sensation, and trying to systematically break down their fears in order to achieve the great things they want to achieve. If you are someone who is going to be a peak performer in any career in life then you should go towards fear. One way of approaching fear from a more systematic perspective is by using incremental progressions to break down the cause that is bringing up that fear. From a parkour perspective, if the jump you are trying to achieve is 10ft off the ground and 8ft apart, you would take that same 8ft jump and bring it as low as possible to the ground and try and complete it as perfectly as you can. 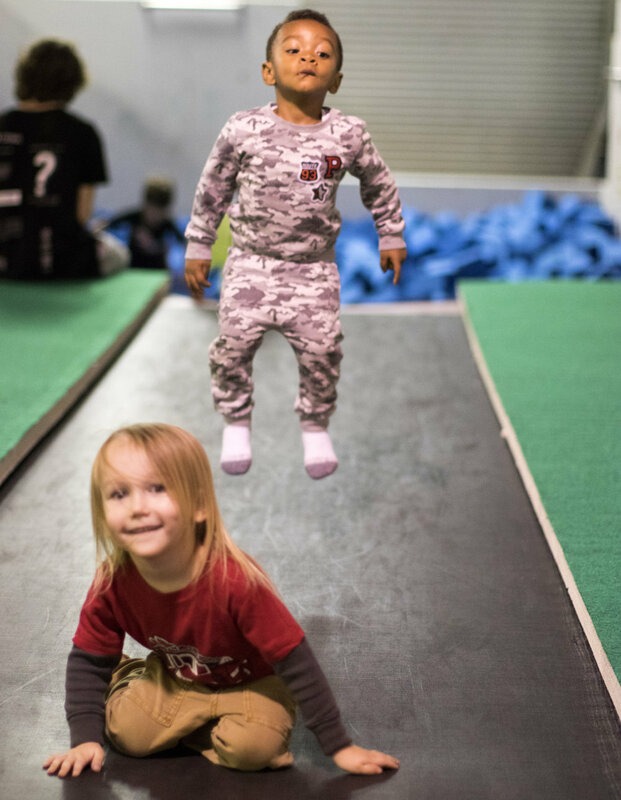 Once you can see consistency in your technique and power, you would then raise the jump up one foot off the ground, and then two feet off the ground, and then three feet, etc. 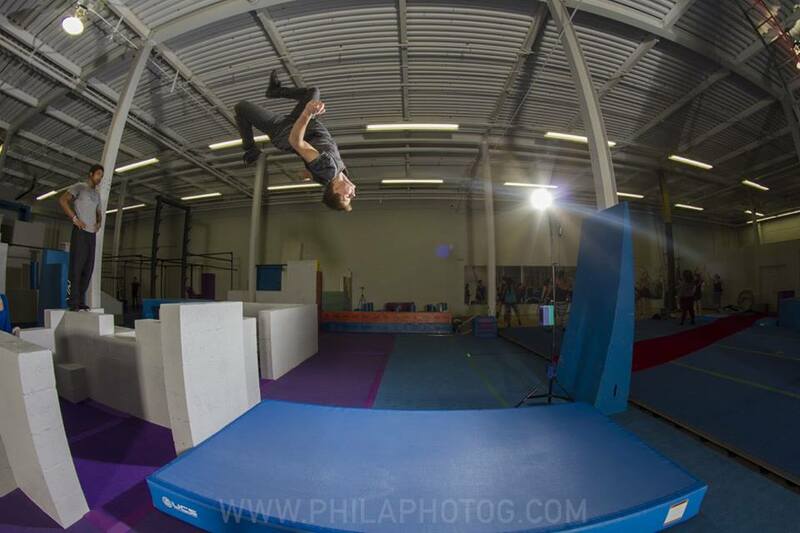 This is the the way some parkour athletes break down their challenges. This is only one approach to being able to break down and overcome your fears. Another approach is being able to try and identify what the worst case scenarios might be and coming up with ways of safely failing and recovering from those scenarios. Parkour Ukemi (The Art of Falling) plays a really important role in someone feeling safer while reacting to a tricky falling scenario. If the practitioner can isolate where the fear is coming from then the appropriate fail or bail out can be practiced to reassure safety of the practitioner, or use pads/spotting in a way that they are sure to remove the fears. However, this in no way guarantees safety of the practitioner but it does minimize all of the individual variables of how, in this case a jump, can go wrong. A very different approach of how to overcome fear is knowing that you can do something and zeroing down to the base facts of what you can do and not letting the outside factors manipulate you into being fearful. It’s important to fully know what you are capable of and committing to that 100% while it’s also important to choose your challenges carefully. This is an in depth and very complex concept that may be extremely helpful to some. This concept is something that can be pretty intricate, it is the main way that some high level parkour athletes, such as Brandon Douglass, train so best to get it from the horse's mouth. This method is not for the beginner, we would say. Committing to anything that is new and intimidating can be a challenge for sure. Becoming complacent in what we have already achieved can be an inescapable and easy trap to fall into if you let it. So let’s try to look at fear as not something to run from but something to analyze and conquer. By utilizing the approaches to overcoming fear like incremental progressions, analyzing your worst case scenarios, and trusting in your capabilities you actively take a stronger stance on furthering your skills as a practitioner or just in life in general. Let’s all strive to control our fear, not let the fear control us. You’ve probably heard the term “practice makes perfect” hundreds of times over your life and never thought anything of it; but does practice actually make perfect? Well, it all depends on the practice. If you practice everything consistently and hit all the motions correctly, then yes, practice can make perfect. However, if you practice a motion over and over again incorrectly, then practice not only doesn’t make perfect but also develops bad habits that will be more than twice as hard to fix later. The ability to reproduce a particular movement without conscious thought acquired as a result of frequent repetition of that movement is called muscle memory. Muscle memory for athletes can be great, but it can also be very detrimental to your progression if not used correctly. In parkour, we build muscle memory through the repetition of certain skills such as a lazy vault, parkour roll, or climb up. Muscle memory helps us to build on top of these skills and allows us to make them more complex. We rely on muscle memory because without it every single movement would require conscious thought each time to make it impossible to build and increase the difficulty of your movements. However, it is important to know when you are performing a move incorrectly because the consistent incorrect practice can cause your body and muscles to learn the wrong form for those movements which could then lead to a greater chance of injury later on. A good way to know if you are performing a skill incorrectly is to either have a coach present who is knowledgeable about the proper form needed, or you can use online resources such as YouTube or other resources from other companies you trust to give you the information about the proper form. However, this does not solve the issue if you are out by yourself solo training. The solution to this, however, is probably located in your pocket. Your cell phone is a great tool that you can prop up almost anywhere and film yourself moving. When learning a new skill, you should be paying very close attention to how you’re moving. Film your movement, analyze it, have other people watch you and tell you what you did right or wrong, everything you can. Watch videos of people who have the skill down really well, and compare it to yourself. Do they raise their knee a bit higher? Which direction are their hips facing, or where are they looking? Where is their center of gravity? Where is their power coming from? Once you know everything you can about the skill or move that you are trying to learn, then you should try it, and each time, re-analyze what you are doing, and where you can improve. Then try it again several times, each time re-analyzing. Then, you should probably take a break. When you’re tired, you can’t perform to the best of your ability, and that means your movement will start to break down, meaning what you are trying to commit to muscle memory won’t be as good as it could be. Building muscle memory should be a lengthy process before you get it down perfect, and you shouldn’t try to rush it more than you’re able. You want to make your movement as good as you possibly can. Take frequent breaks, come back to your movement, and only when you’re absolutely certain that you have it perfectly should you start drilling it over and over again.